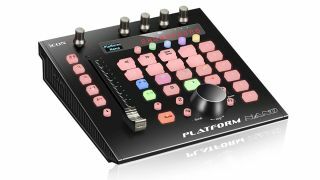 NAMM 2019: Icon is pitching for your compact DAW controller pound with the release of the Platform Nano. Designed to help you carry out a wide range of everyday tasks - selecting and arming tracks, setting timeline markers, zooming and navigating projects, for example - this can be used on its own or in conjunction with other Icon Platform controllers. You get a single 100mm touch-sensitive motorised fader, a jog wheel, transport controls, a backlit LCD display and various shortcut keys and rotary encoders. The Platform Nano runs over USB, and supports all the major DAWs. Indeed, you get silicon shortcut overlays for many of them, though you can also enter User-Define mode to create your own custom MIDI maps, should the need arise. The Icon Platform Nano is slated to ship in the first quarter of the year. We’re still waiting on a price. Icon has also unveiled the OneHub, a powered USB hub that can be used to connect multiple Icon controllers to a single power supply and USB connection. This costs £88.